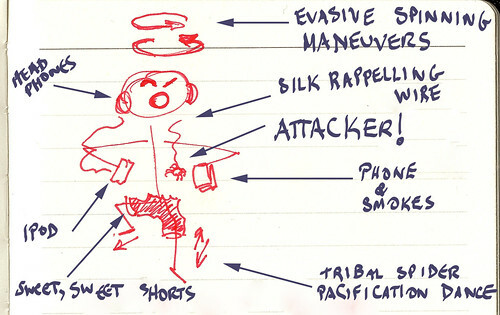 accurate witness sketch, a photo by Gabe Lippmann on Flickr. It seems I'm not the only one being attacked by arachnids as Gabe's sketch shows. Tiff's grandson Ryan, age five, drew up a schematic to assist him in his investigations, and tho' it wasn't as clear as this, still, it was rather good. Facts: Saturday last week a spider was observed dashing headlong across my desk as though it had spare necks in its pocketses. It turned up a day later on the wall in the hall. The next day it was a foot from my pillow as I lay in bed. His conclusion: Baba (Tiff) loosed the spider upon me from a love of mischief. She drove up, hid, and threw the spider at me.